This is variously referred to as Wheaten Bread (mainly in the north), Brown soda bread or just Brown Bread and there are probably as many different recipes as there are cooks. At its basic level it is much the same as white soda bread except with whole grain flour. There are two recipes here, the first for Brown Soda Bread at its most simple, the second for a slightly more complex whole wheat bread, though it’s also an easy recipe. If not made with a light touch this can be heavy and doughy, so handle with care. The most common mistake people make when first making soda bread is to think that the ingredients look too simple and so adding or altering ingredients. This is a very simple recipe, but it works, so just stick to it! As I write there is a loaf of this very bread baking in my oven, smelling delicious, which I am making to photograph for this article. We will eat it too of course! IMPORTANT: All the notes on ingredients for white soda bread also apply here, so if you have not read them, do so before you start. The recipe I use most often has twice as much wholemeal as white flour, but you can also use half and half, which makes a lighter bread. There is a second recipe below for a more substantial brown bread, which is excellent thinly sliced and served with smoked salmon. Preheat the oven to 450ºF (230ºC/Gas Mark 8). Do not start until the oven is hot. Put the wholemeal flour into a large mixing bowl and add the sieved white flour, salt and bread soda. Mix well. Scoop out a well in the flour and pour in about ¾ of the milk. With your fingers draw the flour into the milk, mixing them with as light a touch as you can. The dough should come together easily into a soft ball, if it is too dry add a little more milk but avoid allowing the dough to become sticky. Turn the dough onto a floured board and shape it into a flattened oval about 2 inches high. No kneading is required. Cut a large cross into the surface. Place in the oven immediately. After 10 minutes reduce the heat to 400ºF (200ºC/Gas Mark 6). Bake for another 30 minutes. Remove from the oven and knock on the base of the loaf – if it sounds hollow it is done. If not return to the oven for about 5-10 minutes more. This is a variation of brown soda bread which makes a loaf type bread that is darker and more moist than the one above and has a slightly nutty flavour. It is heavenly with smoked salmon or with any kind of a cold seafood platter, or just with butter. Which brings me to…. Irish butter has a higher fat content and a lower moisture content than typical American butter, which gives it a much higher smoking point. This means it can tolerate being cooked better, giving a lighter and less watery result. Higher fat also means more flavour, so you need less butter. This may sound irrelevant, but it explains, at least in part, why recipes that work perfectly in Ireland can taste different, and not always as nice, when they are made somewhere else. Many specialty food stores in the USA stock European butter and those that do usually have Kerrygold, a well known brand of Irish butter. Which is all very well, except that it is counted as a luxury gourmet item and is about 4-5 times as expensive as it would be here. So using it would make for pretty expensive cooking! A good alternative in Irish recipes that call for butter is to use half butter half sunflower oil, which about brings the fat content up to the same level, though it will not replicate the flavour. Another good option is to use clarified butter, if you can get it. Preheat the oven to 400ºF (200ºC/Gas Mark 6). Do not start until the oven is hot. Spread the wheat germ on a baking tray and place in the hot oven for 3-5 minutes until it is lightly toasted. In the meantime mix all the dry ingredients together in a large bowl. Whisk together the egg, oil, honey and about ¾ of the milk. When the wheat germ is done, leave it for about 2-3 minutes to cool a little then mix it in with the dry ingredients. Cut the butter into small pieces and with the tips of your fingers rub it into the flour. Make a well in the centre of the flour mixture and pour in the milk mix. Quickly and bring the flour in from the edges and mix with the milk, until all the ingredients come together into a soft slightly wet dough. It should not be overly sloppy, you should feel you could pick it up without it running through your fingers, but it should be soft enough that it sinks slowly down and takes on the shape of the bowl. If it is too dry add a little more buttermilk. There is no need to knead this dough. Put into a 9″ x 5″ loaf tin, the inside of which has been smeared with a little butter or oil. Place in the oven. Bake for 50 minutes. The bread should be nicely browned, have a good crust and sound hollow when you tap it. If it seems a little underdone, put it back in for 10 minutes. Allow the bread to cool in the loaf tin before turning it out. This bread keeps for a few days, and is much easier to slice thinly if you wrap it in aluminium foil and keep it until the next day. Few Medieval towns in Ireland have retained their surrounding outer walls. Add dough to tin, wet your hands and press down the dough. Place in oven for 45 minutes or till temp internal of bread is 180. Loved this Irish brown bread in Ireland. I created my own version adding 10 grain bran, flaxseed, sunflower and pumpkin seeds, and hazelnut yogurt instead of oil. It is so yummy and fills you up for hours! I too am Irish, living in the US just over a year. I have to agree with you about the butter, it tastes very different here than at home. Partly its because then cows are grain fed, and this affects the colour and flavour of the butter, since it has a higher level of CLA among other fatty acids. You can get Kerrygold in Trader Joes, and it costs 2.99 for a 1/2 pound – I bought two today! It might be a little more expensive, but it SO worth it for the taste of home! Fantastic! Better than the wholemeal bread we loved in Ireland! only thing is the amount of oil isn’t mentioned. I used 2 tablespoons and it was perfect. Best recipe I’ve found for this bread. THANK YOU!! An old tip for keeping soda bread crust moderately soft. While its cooling wrap it in a damp cloth (clean damp dish cloth). That prevents the surface of the bread losing too much moister during cooling. The stores here in the United States dont seem to stock Wholemeal flour, but do have wholewheat flour. Is it the same? I used whole wheat white King Arthur flour and it worked well. I was told by a person from Germany that this is the closest to the European flour. He told me to use 2/3 cup flour and 1/3 cup cake flour which I do when I bake European cookies. It does make a difference. The recipe that I have from Ireland calls for 1 pint wholemeal flour, 1 tsp salt, 1 tsp bread soda,1 tablespoon bran, 2 tablespoon wheat germ, 1 tablespoon porridge meal, 1 tablespoon hone, 1 tablespoon olive oil and 1 pint buttermilk, A lady at a bed and breakfast gave this to a friend in Germany when they visited there. She told me she added nuts and other healthy ingredients. She said it kept her full for a long time. I used a device that measures in us and grams. No instructions so I was glad to find these. I baked it at 350 and it was a little damp in the middle in a loaf pan so I will try it like artisan bread the next time and make it in a round and at the higher temperature. I also added some chopped pecans to it and a tablespoon Chia seeds. I did not have bran so I omitted it. I’m from the U.S. and I too am looking for the recipe of the brown bread that I ate in Ireland a month ago. I bought an Irish cookbook, Rachel Allen’s, “Bake”, while I was there and made the recipe from that book and now I’ve made the first recipe above. They are wonderful, but not what I remember. The bread was darker and I’m wondering if they used molasses in theirs. Does anyone know of recipes that use molasses? I just starting my hunt online so my experimenting will continue. And yes, my online research says that authentic Irish Soda Bread contains very few ingredients–from memory: flour, baking soda, salt and buttermilk–that’s it. I’m assuming the bread that we ate was a modern interpretation. I did order “wholemeal” bread from King Arthur here in the states and shipping was reasonable. Trader Joe’s has Kerrygold Irish butter and when I Goggled it, it appeared that Costco may also carry it. The below quote taken from flourbin.com does a fairly good job explaining the differences between whole wheat and wholemeal. “In practical terms, wholemeal and wholewheat are the same thing. Wholemeal has always been tightly controlled and has always meant the whole grain with nothing added or removed. Wholewheat was a name invented by some of the millers and some of the health food trade to get round the old bread and flour regulations. Wholemeal flour has always been harder to handle because it contains all the grain offal and is therefore heavier, so the millers worked out that if they let it down with something else such as malt flour, it would be much easier to use and with a catchy name like wholewheat which wasn’t defined anywhere, the problem would be solved. The marketing was so successful that the average housewife believed that wholewheat was the pure one and wholemeal the adulterated one – pity, that’s the wrong way round. In the recipe at the top for Irish Brown Bread, sugar is mentioned in the method but not in the ingredients. What quantity is required? I made a brown bread yesterday but thought it lacked flavour, it had salt but no sugar, so maybe that could make a difference. In fact the mention of sugar in the method was the error. There is no sugar in this recipe. The flavour in this comes from the wholemeal flour and the buttermilk, so maybe a different brand of flour or changing the proportions of white and brown would help. I have just slightly amended the recipe to change the proportions anyway, as I do in fact tend to use more wholemeal than white by weight. Some people also add a teaspoon of cream of tartar – I don’t know if this affects the flavour though. I’m Irish, living in Athens,Greece and still miss the soda bread.I’m going to try the basic Irish Brown Soda bread recipe tomorrow.and let you know how it turns out. Can’t wait!! I am in Australia and the flours here are different to those in Ireland where I grew up making and eating Irish Soda Bread. I would suggest that Ann in Athens looks into buying in some brown flour or premix soda bread from Ireland. I am sure that being in Europe you would not have the quarantine barries we have here. And yes, there is never honey or sugar in soda bread – only ON it sometimes, and there’s nothing better than homemade chick liver pate on brown soda bread. This is the nicest food in the world. Try this with some home-made raspberry jam and a cup of Barry’s tea, and you’ll think you’re at home (in Ireland), with butter first of course. I make mine with pinhead oats and a spoon of honey and a small carton of yoghurt added to the milk, oh and a beaten egg. THis all seems to make it rise a bit more and is moist and delish. I also think that everyone who makes this puts their own personal touch to it, so there is no really proper recipe, just get the scientifics right and add and subtract a bit yourself. It’s yummy too with cheese and chutney (pickle) and a drop of wine. I too first had Brown Soda Bread when traveling in Ireland, and have only found it once in the states, and it didn’t taste any where near as good. I’m about to try the second recipe, but it mentions oil in the instructions, but not in the ingredients. I’ll try adding just a tablespoon and hope for the best. I’m facing the same conundrum – what to do about the oil not listed in the ingredients but included in the instructions? Does anyone else have any feedback? Thanks! So excited to try this delicious recipe. Just to add, with the soft flour you won’t need extra buttermilk, but no amount of it will make up for bread flour. 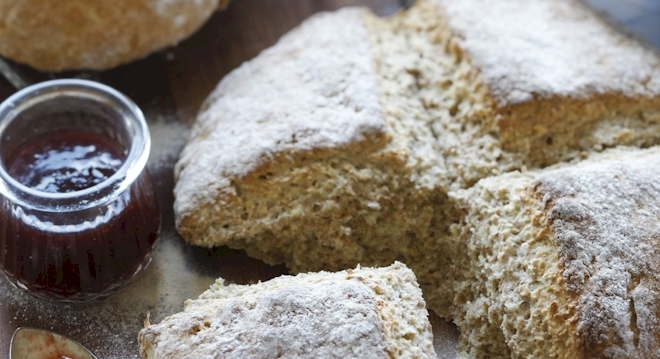 One of the things that makes Irish soda bread work is the softness of Irish flour, and its low gluten content. Bread flour is very hard and high in gluten. I know it seems counter intuitive that the worst flour possible to use for soda bread is bread flour, but it is so. I’ve written about choosing the right flour on the recipe for white soda bread (I linked to that above, but you obviously missed it, so I’ve edited a bit to make it clearer). Try again with a softer low-gluten flour, and I think you’ll get a MUCH better result. Also noting that the rolled and steel cut oats would absorb much of the moisture my thinking is the above measurements needed more buttermilk…? The ingredients for your traditional Brown soda does not mention sugar but the method does. I think this is where the confusion has arisen. Will try recipe and let you know. I completely agree, Irish soda bread should never ever contain sugar/honey/syrup or any sweetener. Ever. The first recipe above is for traditional Brown Soda Bread, and has no sugar. The second recipe is for an Irish style wholemeal bread, which is a different thing entirely. It still uses soda as its raising agent, but has a different appearance, taste and texture to the traditional version. You can leave the honey out. But from experience in baking it without, when I didn’t happen to have honey about, I can tell you that it’s still nice, just not AS nice. Oi! C.L. Cross. A kilometre is five eights (5/8) of a mile. Can be confusing! We know what we mean! I still use pounds instead of kilos! And I’m only 34!! Thanks for your recepie. I have to agree with Lynn about the sugar. Never the less I plan to make the recepie today as it is! Happy baking! my gran came from northern ireland about a century ago. her recipe just called for flour, baking soda and buttermilk. the loaves were round and flat. but after it cooled completely, she would slice them in half and fry them in bacon drippings til brown and crusty and we would eat them for breakfast with bacon and eggs. oh, so good. ive never heard of any other recipe like that, but we always ate it like that! You are describing soda farls, which are a variant of soda bread mainly found in Northern Ireland. And yes, they are fried and are utterly delicious, although definitely not health food!! Put all the dry ingredients including the sieved bread soda into a bowl and mix well. Whisk the egg, add it to the oil and most of the buttermilk. Make a well in the centre of the dry ingredients and pour in the liquid, mix well and add more buttermilk if necessary. (I did not find it necessary) The mixture should be soft and slightly sloppy. (like biscuit dough) Pour into an oiled tin and bake for 60 minutes approx., or until the bread is nice and crusty and sounds hollow when tapped. Cool on wire rack. Note: my neighbor would add finely chopped nuts such as pecans or pumpkin seeds as she felt like it. I substitute honey for the brown sugar, or leave it out altogether, increasing the salt instead. I have made this dozens of times since I’ve been back in the US and it comes out delightful every time. I am going to try this right now. I will let you know how it came out. Excited. Don’t increase the salt , it will taste too salty ! I use a recipe much the same as yours to which I add about 50g of sesame seeds and sprinkle some on top of the dough before baking & press them down LIGHTLY with a fork. Oh & European fluid ounce meaurements are different to US. 16 fluid ounces = 1 pint ,here. I’m irish and just about to make my Mums brown bread buns… I think you have one major flaw in your receipe though. Sorry! Irish bread never has any sugar it in or honey… Or if it does its so little that you dont taste it. Thats the one thing I dislike about some breads when I go abroad. I married an Irishman and we love this recipe. I found this on a fluke and then found the wholemeal flour in a shop and it was beautiful. Eat with Irish Stew or homemade soup….mmmmm….good. Our favorite restaurant in Dingle made the most delicious small loaves topped with pumpkin seeds, and I am delighted to find your recipe and guidance. I hope that wholemeal is the same as whole wheat. I guess I am about to find out! Thanks so much. I am in Ireland right now as I write this and I am crazy for this bread I’ve been eating. As I head home to the US in 2 days, I am looking to make this bread when I get home. A shop in the next town stocks Kerrygold butter so I am excited to try this. Thank you for sharing it. Ireland is amazing and I don’t want to leave! My boyfriends LOVES to bake. This is the repice he’s always stuck with.Grandma VanDoren’s White BreadIngredients * 3 cups warm water * 3 tablespoons active dry yeast * 3 teaspoons salt * 4 tablespoons vegetable oil * 1/2 cup white sugar * 8 cups bread flourDirections 1. In a large bowl, combine warm water, yeast, salt, oil, sugar, and 4 cups flour. Mix thoroughly, and let sponge rise until doubled in size. 2. Gradually add about 4 cups flour, kneading until smooth. Place dough in a greased bowl, and turn several times to coat. Cover with a damp cloth. Allow to rise until doubled. 3. Punch down the dough, let it rest a few minutes. Divide dough into three equal parts. Shape into loaves, and place in three 8 1/2 x 4 1/2 inch greased bread pans. Let rise until almost doubled. 4. Bake at 350 degrees F (175 degrees C) for 35 to 45 minutes. The loaves may need to be covered for the last few minutes with foil to prevent excess browning. I can’t wait to try this recipe! I lived in Ireland and fell in love with the dense brown bread (2nsd recipe). I will have to leave a comment after I make it to see if it stands up to my expectations. Yummy, slice of brown bread with butter and a cup of Lyons Green Label tea… my mouth is watering.